I have Down syndrome. I graduated from Kagoshima Women's University in the Department of English Literature on 20th March in 1998. The commencement was the best day of my life that my dream came true. In the month of May, I made a speech by English at the 3rd Asia Pacific Down Syndrome Conference which was held city of Auckland in New Zealand. I obtained a librarian's license in 1999. I'm studying French and English conversation at Shigakukan University of my alma mater as an auditor now. Besides studying foreign language, I'm making a speech and exchange about Down syndrome and I'm asking many people for an understanding. I want to introduce this impressionistic essay. Then, I've had come to know about Prenatal Diagnosis. I submitted objection to our opinion about 'maternal serum marker screening test' to the Ministry of Health and Welfare. 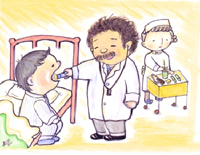 In 1999, I translated picture book "Magic Candy Drop" into English written by Yukihisa Matsuda who is a pediatrician. Also, I published "Yumetsumugu-Aya"(meaning: Spinning dreamer Aya). 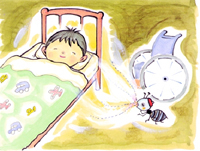 I translated Canadian picturebook "How Smudge Came" into Japanese in 2001. My dream is becoming a librarian and translating French picture books into Japanese. I made a presentation of these experiences at the 8th Down Syndrome Conference in Singapore. First, let me tell you a little about myself. I was born at Kagoshima University Hospital in 1973. My birth must have been a very big joy for my father and mother. However, I developed jaundice and was put into an incubator for about two weeks. When we were leaving hospital, the doctor told my mother that I had Down syndrome. My mother says that she can't remember how she got home after the shock of hearing that. I had complications: heart trouble and pyloric stenosis. Pyloric stenosis is a narrowing of the pylorus, which is the outlet from the stomach. This makes it hard for any food, even milk, to leave the stomach. As a result, when I had a cold, I often vomited my food like a fountain, even my mother's milk. I would vomit repeatedly when I was lying down, and my mother often had to sleep leaning against the wall while she was holding me. I went to a Montessori Catholic kindergarten when I was a child, and I enjoyed the comfortable, carefree environment there. But before I entered elementary school, I often had to sit down and rest. An examination at Kagoshima University Hospital showed that I had hypothyroidism, a condition in which the thyroid, which is an organ located in the front part of the neck, makes too little thyroid hormone. As my symptoms were becoming more serious at that time, we moved to Hayato, a town with hot springs and very pleasant surroundings, to take a rest from Kagoshima City. I was in ordinary classes through elementary and junior high school. I passed an entrance examination for an ordinary public senior high school and graduated three years later. I then entered Kagoshima Women's University, which was my dream, and have now graduated. "It is a very wonderful that there is Miss Aya Iwamoto in the graduated students. Her intense figure made a deep impression and courage on the many school-mates. That must gave a hope and encourage people who have same handicap. Her effort is wonderful. It is our pride to assist her studies." I was deeply moved by his speech, and tears came to my eyes. My parents shed in tears, too. It's my dream to become a librarian in a quiet library. I am studying French, too. I want to go and see the pictures in Le Musee du Louvre and Le Musee d'Orsay in France. My hobbies are listening to music and looking up words in the dictionary. Today, I am going to talk about my personal history book. On 25th January, 1998, my parents published Hashiri-kitareyo-Akoyo, that means, "Come to Mama, Dear." The book is subtitled "A child with Down syndrome weaves her dreams and goes to university". My mother and father wrote the book about the period from my birth to my entering Kagoshima Women's University, and I wrote my impressions of the book at the end. I have been sick since I was born, and my parents have had a lot of trouble. I grew up without knowing much about my illness. When I was in my second year at university, I learned for the first time that I have a handicap. While I was watching a program about Down syndrome on Japan's NHK television, I asked my father about it, and he told me I have Down syndrome. I had suspected something like that, but it was a great shock for me when I was told. My mind went blank. Then I saw my mother writing about my illness on a word processor. It really surprised me, and I didn't want to believe it. I was very sad. I learned that my parents were going to publish my personal history in a book, making my illness public and telling about our family life. I worried about it, and I didn't want them to reveal my illness. I cried bitterly. My father and mother said, "You have done wonderfully. Don't be afraid. Take pride in yourself." I talked about my worries to Dr. Tanaka, who works at the Child General Consultation Center in Kagoshima City. He said, "It is very important that you tell about your handicap." At first, I didn't think I could tell everybody the truth, but I was encouraged by his words, so I made up my mind not to try to hide my condition anymore. Also, my relatives and my parents' friends encouraged me. I'm not afraid any more, and there's no need to hide the truth. I want many people to read this book that my parents have published. I'd like them to understand the feelings of the handicapped. The book has finally been published. We got a lot of letters and telephone calls from all parts of Japan. People said that the book was deeply moving, that my example gave them courage, that they cried reading the book, that they found hope for the future, and so forth. We were encouraged by their messages. I think that it was a very good thing that my parents published this book. I also hope to work with handicapped children. I have a lot of dreams. People have a shallow view and prejudice against Down syndrome in Japan now. It's a pity. Life is short, but precious. That's why I won't give up my hopes and dreams. I am grateful to the many people who helped me, and I want to say to my parents, "Thank you for giving birth to me." I have continued giving lectures and taking part in exchanges all over Japan since I graduated from university. I've given a lot of lectures, in junior colleges and universities and at nursing school festivals. After the lectures, people in the audience have written their impressions in very moving essays. Their words were simple and kind-hearted, and they encouraged me and moved me deeply. Many people have attended these lectures all over Japan. There were 1500 people in attendance just in Okinawa. Senior high school students in particular attended, and they listened intently to my speech. After each lecture, the lobby was crowded with students, and they asked me about everything. Recently, in the Shimin-Kaikan hall of Fukushima Prefecture, the audience included students from junior high school, senior high school and a nursing school. Writing their impressions of the lecture, they mentioned their own ideas and goals in life right now and how their points of view on Down syndrome, handicaps, prenatal diagnosis, etc. had changed. "Today, I learned about your speech from the newspaper and was able to attend your lecture. My child has Down syndrome, too. When we were first told of it, we were greatly shocked. We were at a loss what to do and how we could raise our child. Actually, our child is in hospital, and we aren't raising her, but I was listening to your talk today and I felt a little relieved to hear what you said. On raising children, it should make no difference to the parent whether the child has a handicap or not. I want to accept my child as she really is; I won't compare her with other children, I will just bring her up naturally. This is my idea today. I think we ourselves, the parents, can continue to grow, by bringing up our children, by finding things of value in our children. Today was a wonderful day." When I made a lecture tour of Japan, I met many people who had been suffering from social discrimination and prejudice. I met a mother who has a baby with Down syndrome in Shimane. Her baby has a serious heart disease and when she was trying to arrange for an operation, the doctor of a famous university said, "It is useless to operate on your daughter. Children with Down syndrome don't know their parents' faces, anyhow." She was very shocked at what he said. I thought it was very terrible, too, when I heard about it. Her mother told me in tears, "I saw you on a television programme, and I was so pleased!" I became a member of Japan Down Syndrome Network (JDSN) and came to know about the problem of prenatal diagnosis. I also learned of the triple-marker test, which tests for three handicaps, including Down syndrome. The problem is that such procedures deny people with Down syndrome the right to life. Whether one has a handicap or not, all people are equally human, with the same right to life; there is no difference in the importance of different people's lives. Human lives are equal in importance. Many specialists, doctors and the parents of children with Down syndrome started a movement to submit a petition to the Ministry of Health and Welfare (the present Ministry of Health, Labour and Welfare)'s committee. I also submitted the petition two times myself. No person with Down syndrome had ever presented this petition before. After one lecture that I gave, a third-year senior high school student wrote on her questionnaire the following very moving reaction. She said, "I have been thinking about prenatal diagnosis. I felt that unborn children can't even think for themselves; whether they have handicaps or not, they don't even realize that they are alive. But then Miss Aya said, 'Thank you for giving birth to me,' my old way of thinking completely disappeared, and I felt very ashamed of myself. What is important is not to get rid of handicapped children, but to find a way to live well with them. I need to think about how handicapped children can have good lives. From now on, I hope to show the people that I come in contact with how precious they are." I was deeply moved by her message. I hope many people will come to feel the same way. When I was a child, I could see from my house the white buildings of Kagoshima Women's University high on a hill, and I longed to go there. I had a dream of entering and graduating from Kagoshima Women's University. I was able to realize this dream. I studied about children's rich imagination, human kindness and love. These became the theme of my graduation thesis. Next, I had a dream of trying to do something connected with these interests of mine. When Dr. Yukihisa Matsuda, a pediatrician, asked me, "Aya, could you put my Maho no Drop into English?" I had both high hopes and some uneasiness. Still, I decided to try to translate the book into elementary English in order to move closer toward achieving my dream. I was able to translate this book into English, and it was published in October, 1999, as Magic Candy Drop: Story by Yukihisa Matsuda, illustrated by Yasuko Kuroda, translated by Aya Iwamoto. This achievement brought me great pleasure. I would like to introduce part of this book. I'm studying French at university now, and I'm interested in French culture. I want to travel around and visit museums, too. It has been my dream for many years to travel to France with my family, and we were able to go there in June, 2000. I visited Le Musee du Louvre, Le Musee d'Orsay and Le Musee Marmottan, which has a collection of the works of Monet, my favorite painter. Paris is a very beautiful historic town. In January, 2001, I published my travels in Paris as Yumetsumugu Aya (meaning:Spinning Dreamer Aya) jointly with my mother. In the same year, I got a request for a translation of a Canadian fairy tale, How Smudge Came: story by Nan Gregory, pictures by Ron Lightburn, translated by Aya Iwamoto, from the Akane Shobo publishing company in Tokyo. I was able to publish a second fairy tale book in June. I felt highly honored to be asked to translate this picture book, written by such an excellent author, who has received an award in Canada for his writing. 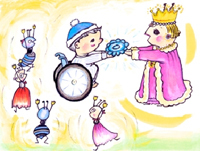 Another dream of mine is to translate and a make picture book for a French fairy tale so that it could be read to and heard by many children, especially handicapped children. I also still want to be a librarian. Let me mention one more of my dreams. I want to translate into Japanese some interesting children's picture books from Singapore. Finally, I want to say once more to my parents, "Thank you for giving birth to me." And, I hope peace will come to the whole world. The Magic Candy Drop. Yukihisa Matsuda, illustrated by Yasuko Kuroda, translated by Aya Iwamoto. Sekifusya publishing company Tel:81-92-714-4838, Fax:81-92-725-3440. 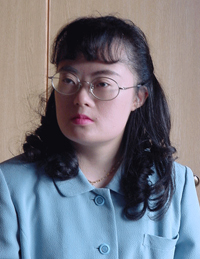 This paper was presented at the 8th World Down Syndrome Congress in Singapore, 14-18 April 2004. One night, he hears something. Ken wakes up and looks about. There is an ant behind one wheel of his wheelchair. "Thank you for all the bread you give us. We are going to have a party next Sunday. Our queen ant really wants you to come." "Really?" "I'll wait for you under the poplar tree. Don't forget." The ant went home. Ken pinched his cheek. "Ouch! This isn't a dream. I want to go to the ant's house, but my doctor will not permit me to go out." There is a check-up every morning in the sanatorium. Ken's doctor has a mustache. Children call him Dr. Kuma. "Morning, Ken. How are you today?" His doctor is listening to Ken's throat and chest with a stethoscope. He also examines the back of Ken's throat with his penlight. "O.K! You're in good shape!" Ken smiles. Then, he tells the doctor about the ant he met the previous night. "O.K. I'll give you permission to go out. The ant's house is dark, so it will be good to take this." He puts his penlight in Ken's pocket. On Sunday, Ken puts on his hat and happily wheelchair to the Poplar tree. The ant is waiting for him. The ant's house is in a hole in the poplar root. "Hey, we can't get into that small hole!" Ken looks a little worried. "Close your eyes. Try this red candy drop. Then, count One, Two, Three and open your eyes." He closes his eyes and tastes it. "One…., Two…., Three…. Wow! I'm the same size as an ant!" "Now, Ken, let's go. Welcome to our house!" The ant pushed his wheelchair into the hole. "It's too dark to see much of anything." "Ken put on your glasses." Surprise, surprise! There are a lot of doors on both sides of the hall. The ant opens the doors one by one. "We keep the food which we have gathered here." Ken hears crying from the back. "That's the nursery. Everyone grows up together here." 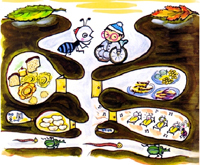 There are egg rooms, soldier ants' training-rooms and worker ants' rest areas, too. Ken and ant proceed to the back quickly and arrive in front of a pair of big doors. "Hurray! We won. Hurray, Kurumaisu Mighty!" "Ken, thank you very much. I'll give you this blue candy drops as a token of my gratitude. Try to eat a piece of it every day, during the winter. Something good is sure to come to you in the spring." Ken took the blue candy drops and left the ants' house. "Good-bye, ants. See you again in the spring." Every day that winter, Ken eats a piece of the blue candy drops which he got from the queen. In spring, the cherry blossoms bloom in the garden of the sanatorium. Ken takes a walk as usual and has a rest under the poplar tree. Oh? There is no wheelchair. Yes! Ken can walk now. That candy drop which he got from the queen ant was magic. Ken leaves the sanatorium soon. "I'm going to an elementary school in my town."